CAP is an accurate flight simulation based around the F-14 Tomcat and the F/A-18 Hornet. Both launched from a carrier during Operation Desert Storm, you receive your missions and carry them out. The usual options apply, like configuring your aircraft, and choosing a pilot, but there are some more unusual options, like calling in sick for a mission. This causes you to skip a mission if you don't like the sound of it, but if you use it too much command may get suspicious. The flight model is realistic, and there are some animations. 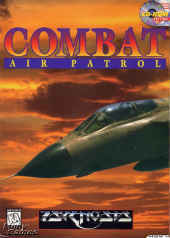 One feature missing from the PC version is the strategic side - you control the ground operations while flying to support them on the Amiga version.